Although not all burglaries are committed in the dark, the majority of burglaries are committed at night time. If you’ve got something in the dark to protect in Southern Florida, don’t you think an infrared (IR) security camera is a wise investment? Infrared security cameras may not be able to stop a crime in progress, but they can alert you to one in progress. Not only can they alert and document a crime in progress, but once word is out that your business or residence is protected by infrared security cameras, it’s less likely to be a target. Besides crime prevention, infrared security cameras have other applications as well. An infrared security camera makes an excellent baby monitor because it emits infrared “light” that the human eye can’t see. Using an infrared security camera, you can monitor your baby all night long without disturbing him or her. Digital video security cameras work by focusing light through a lens onto a special electronic light sensor. There are two types of sensors Charged Coupled Devices or CCDs and Complimentary Metal Oxide Semiconductors or CMOSs. 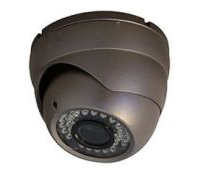 An infrared security camera usually has a very sensitive CCD. In fact CCDs are inherently sensitive to infrared radiation in the near infrared range. Infrared security cameras usually have an array of IR Light Emitting Diodes or LEDs that surround the lens or are in a cluster next to it. These LEDs emit IR “light” much like a spot light or flood light toward the target area. In this way , the IR camera actually provides its own light. This makes an IR security camera an excellent tool for detecting night time dark-area crimes like burglaries. Infrared security cameras function as a normal digital video camera in conditions where there is visible light. In fact the camera normally has a separate sensor that tells it when to use the IR mode. IR cameras produce high quality color video images in normal mode and high quality black and white or monochromatic images in IR mode. Since IR radiation is not visible, there is no color associated with IR illumination, but the clarity and quality is still present. Since IR security cameras due supply their own illumination, the target area is limited. Generally, the more LEDs in the array surrounding the lens or in the cluster, the farther the camera can reach to produce a clear, crisp image. This is analogous to flash photography, where the intensity of the flash has a limited range to produce a bright image. Before purchasing an infrared security camera, be certain of the range you will need for producing your video. All IR cameras normally have their respective range limits published as part of their specifications. If you are in doubt, ask one of our digital security experts. Infrared security cameras are versatile in application; that is, there are many additional features and options that make installing and using them easy. For example, standard cameras have a coaxial cable that is run from each camera to the processing unit. However, there are also IR cameras that use wireless transmission. These cameras use the 2.4 or 5.8 GHz radio band to transmit their video, eliminating transmission cables. There are also cameras that have pan, tilt, and/or zoom (PTZ) controls. These controls allow the camera to move horizontally or vertically to increase their field of view. Zooming takes advantage of telephoto lens technology to enlarge objects. These controls may be operated manually or remotely. PTZ cameras with motion detection can be programmed to start recording upon detecting motion and following or tracking an object along its path. If sound is important there are IR security cameras that can record audio in addition to video. Of course, IR security cameras are available for use indoors as well as outdoors. Modern technology and innovative applications make infrared security cameras an affordable solution to protecting, monitoring, and recording for Southern Florida businesses as well as residents. Ask one of our experts about getting your protection today.